You are here: Home / Android / How to root Samsung Galaxy Grand 2 (SM-G7102) and install CWM. This post shows the simplest methods which you can employ to root Samsung Galaxy Grand 2. This method works only on SM-G7102 variant, which is dual SIM version available in India. You all might be aware that Samsung had recently released official G7102XXUANE2 firmware which was around 118 MB of size. I hope all of you have updated, else you can download the complete firmware from here. After you have updated, you can follow the root procedure so that you have latest firmware with root access. As mentioned earlier, this method is valid only for Grand 2 SM-G7102 variant. Do not try it on other variants; else you may brick your device. If you are not sure what version you have, you can check it by going to Settings> About device or pull your battery and find it mentioned on the sticker. Warranty: Once you root your device, your warranty will be voided. However, you can regain your warranty back by flashing official firmware. Disclaimer: This guide has been tested by me and works flawlessly. I am not responsible if you soft brick your device. Make sure that you have enough battery, preferably over 80% so that it doesn’t turn off during installation. You should have USB debugging enabled. To do this, go to Settings> Developer options and check the option which says “Enable USB debugging”. Make sure you have Samsung’s USB driver installed on your PC. You can download the setup from here and install it. Backup your entire data. Though this is not needed, but it is recommended to take complete backup, just in case if anything goes wrong. For this purpose, you may use Wondershare MobileGo for Android software, which comes with free trial. Alright, after following all the steps above, you are now ready to follow the next procedure. Remember, you must follow all the steps carefully in order to root your device successfully. First of all, download CF auto root tool from Chainfire. Link. The CF Root tool was recently updated, so now it supports Android KitKat as well. You can use this same tool for rooting your Grand 2 running on Android 4.4.2, download it from here. Just follow the same methods below. Now extract CF-Auto-Root-ms013g-ms013gxx-smg7102.zip at your desired location. You should get two files, one .tar.md5 and Odin3 v3.09.exe along with few other .DLL files. Now, switch off your Grand 2 and put it in download mode. This can be done by simultaneously pressing Home, volume down and lock key together for about 4-5 seconds. It will display warning message, so continue by pressing Volume button. Go to the folder you extracted, and right click on “Odin3 v3.09.exe” and select “Run as administrator”. Connect your device to computer via USB cable. Once Odin detects your device, it will display ID: COM with light blue back ground and Added under message box of Odin. Once the file is added, you should click on “Start”. It will start the process. When the rooting process is completed, Odin will display the message as “PASS” or “RESET” and your device will be rebooted automatically. Congratulations!!! You have successfully rooted Samsung Galaxy Grand 2. After your phone reboots completely, you can go to app drawer and check “Super SU” app installed. Alternately, you can install Root checker app that will display the root status. Related: Galaxy Grand 2 review. Once you have rooted your device successfully, just download Flashify app and grant root access. Grab the Philz recovery image file from here and flash it using this app with in-built options. In case if your phone is stuck at boot animation after rebooting, than you will have to reset your device. Note: You will lose your entire data after performing the following steps. o Remove your battery so that your device is shut down completely. o Insert it back again, and enter into recovery mode by pressing Volume up, Home and lock key together. o In this menu, you have to use volume keys for navigating and power key for selecting the highlighted menu. o From that menu, go to “wipe cache partition” and select it. o After this, go to “wipe data/ factory reset” and under that menu, select “clear all” option. This will delete entire data from your smartphone’s internal memory. o Select “reboot system now”, so that your phone starts normally. o You can now restore your data from the backup which you had taken. Do let us know and share your feedback below. In case if you need any assistance or having issues during installation, feel free to ask. Thanks to user @balliboxer for cf root tool. This guide works on both G7102 as well as G7102T. Follow all the steps listed above under “pre-requisites”, make sure you backed up your data and have drivers installed. First of all, put your device in download mode and connect it to your PC through USB cable. Run Odin as administrator and configure it as shown in the image below. Download Philz Touch recovery from here. Next, download Super SU zip from here and place it in your internal memory. Click on PDA in Odin and select tar.md5 package you just downloaded. When it is done, just pull off your battery and reboot into recovery by pressing the 3 key combos. In recovery mode, select “Install zip”. Select the Super SU binary and flash it. Reboot your phone normally and startup Super SU app. 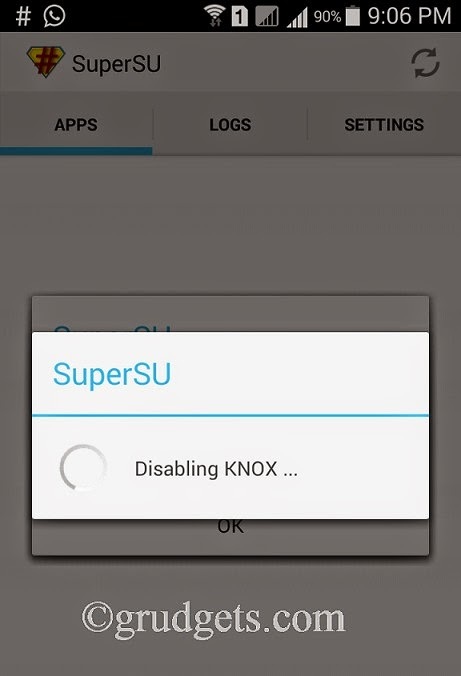 It will show message as “disabling KNOX”. Once done, go to recovery mode again and flash Super SU zip. After you follow all steps properly, you should have proper root access. 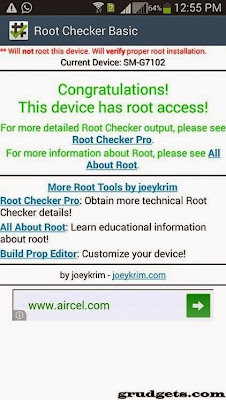 You can check it with root checker app. 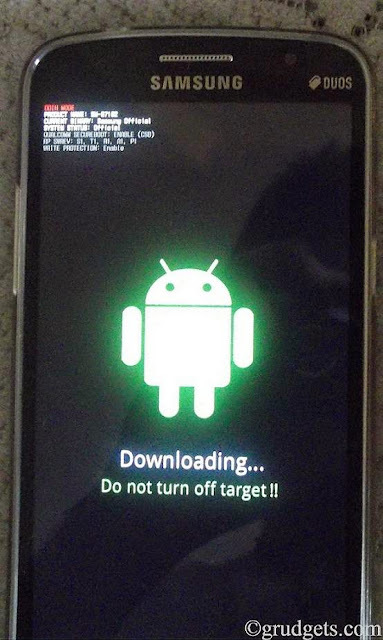 Note: Normally, when you have flashed tar.md5 package, the phone should reboot into recovery. But if it doesn’t, repeat above steps and uncheck “auto-reboot” in Odin. Thanks to XDA user @ali.filth for TWRP and Philz recovery for Grand 2. Samsung Galaxy Grand 2 review (SM-G7102), available from 18k. Huawei Honor 3C smartphone review, available from $199. THL W200S smartphone review, available from $199. HI can you help me I follow your instruction in rooting Grand duos 2 but i have a problem during the rebooting and stuck during the animation reboot. and I try to do the reset instruction. and then the result still the same my mobile does not restart always stuck in the reboot animation. Please help. You might have not followed the steps correctly or tried it on other variant. Download the complete firmware from that link and flash it using ODIN. Also, you will have to register for Sammobile before you’d be able to download. Select device in third dropdown, country in fourth. It will display the most recent updated firmware. Just download and flash it. Can you go to download mode? I want to install Nokia’s here maps to my phone do you know how to do that? Not sure if it works on Grand 2. Give it a try and report back! Hey bro. Thanx for it.. i have a ques.. Will this work with the g7 firmware for grand 2 or only with g4 firmware for grand 2?? And yes, in the method to root grand 2 running kitkat.. what is that after philz recovery.. ‘select su binary and flash it’ where will i get it? And yes.. Thnx in advance!! Yeah, it should work on all builds of 4.4.2. I have installed it on latest H3 firmware and it worked for me! After you have installed custom recovery, you have to flash with Super SU. The download link have been included already in the post. The rooting process does work. You can recover your phone by flashing recovery image (in case if anything goes wrong), but fresh install is usually recommended. USELESS APPLICATION.IT DOESN’T ROOT ANYTHING.I TRIED IT MORE THAN TWICE BUT NO MATTER WHAT I DO IT ALWAYS LEADS ME TO A NORMAL RESTART WITHOUT ROOTING .ALL THIS PROGRAM DOES IS WHEN YOU BRICK YOUR PHONE, IT RECOVERS IT AND YOU CAN RESTART YOUR PHONE NORMALLY.CHECK YOUR PROGRAMS BEFORE YOU ANNOY US.GOT IT? If you were not able to root doesn’t mean it is useless! I have rooted it twice and wordked like a charm. If your phone reboots normally, than it restores stock image. That’s why you have to disable auto-reboot option. Its not possible first time, but next time it is available provided that you do not close ODIN. Hope this helps. done all steps…also there was a \\\”\\\”pass\\\”\\\” message but i checked the root by downloading root checker.. it was not rooted…jelly been 4.3SM-G7102what should i exactly do??? Try using towel root. It works with Jellybean. Bhai, does it really works with samsung galaxy grand2. I recently updated mobile to Kitkat os. I need your help… . Yes, it works on KitKat. Tried on H3 and H6 builds, it works perfectly. can this methos work for build NI2? Should work on I2, but since there is knox present in the new stability update, so may be it won’t work. Just try it out and report it back. Thanks… successfully rooted 4.4.2 kitkat version.. but could you please tell me how to install philz recovery, i dont wanna take risk of bricking phone.. already soft bricked 2 times and it was so hell tiring to install original ROM. You can flash recovery.img of philz touch recovery using flashify android app. Do I need to do both steps to root or only d first? Only the first step. Second is alternate step, which was available until Chainfire got updated. Hi..ist really dont void waranty even we unroot it? Yes, it voids warranty, if you are on latest KitKat firmware with build J2 or K1. Flashing back official firmware doesn’t in these builds work since they have Knox enabled. On H3 and H6, you can regain warranty by flashing official firmware. Please help me. I update my grand 2 duos OTA. And now my android is kitkat 4.4.2. My problem is my sim 2 isnt working anymore. Whats happen and any solutions? You cleared data and cache after installing OTA update? That works. Does this method works with grand 2 latest NK1 firmware build ? Try rooting with other step. May be due to CF tool. I rooted my grand 2 . everything iron running fine except photo file sharing. Whenever I want to share any photo by whatsapp or by viber it’s shows me SHARING FAILED,PLEASE TRY AGAIN. You tried factory reset? That should work in most of the cases. Hi, Just download complete firmware from sammobile and flash it using odin. Make sure you enable USB debugging next time! Hi Mujtaba….i want to root my grand 2….i recently updated my phone with latest updates ota…it shows kernel version of feb 13 2015…so i m bit afraid if root doesnt work and it gets bricked….baseband version DDUBNK1 and build no DDUBOB1….will it work after that recent update? waiting for ur reply….thanks…. eband version: G7102DDUBNK1, build no: KOT49H.G7102DDUBOB1 DATED: FEB13 2015.
hey writer! I have some que to ask u before I root my sm-g7102 running on android 4.4.2 whose baseband version isG7102DDUBNI1 and build no. is KOT49H.G7102DDUBNJ2. 2). Now i installed new firmware which is running on android 4.4.2 in which knox is installed. So should i do second procedure or should i disable it manually.Or i should try 1st procedure first. 3). After rooting my device will recovery booting will be kind of uninstalled? and ya reply as soon as possible and thanx in advance. Thanx a lot .Firstly i was rooted with cwm. and ten i tried to install .img file using flashify. but y recovery was gone . i done everythinhg i could but couldnt recover recovery. but this helped a lot . Just a question can i mount usb storage on grand 2 . because i can see usb storageA….and many more in \mnt folder. Thank you again. Hi, while exiting it asks whether you want to get back to previous recovery. hi i also rooted my samsung galaxy grand SM G7102 success but it refused to restart normally gets stuck at beginning displaying SAMSUNG GALAXY GRAND 2 SM G7102 and can’t even reboot! what can i do please? How do I remove all the root?? Hello There, I followed all steps but still the SUPER SU app is not installed can’t find it after root and philz touch flashing zip file. Please any help ?